Nelson Mandela has died at 95 years old, and the world will remember a man who changed history. Mandela is given more credit than any other individual for bringing down the apartheid system in South Africa, which in turn galvanized many other parts of the world to start fighting against racism and segregation. The latest issue of People devotes a large section to Mandela, and an emotional tribute from the many celebrities and government dignitaries who knew him. Everyone knew who Nelson Mandela was, and even those who had never met him were indirectly influenced by him.In an ironic statement on the influence of celebrity, the same issue of People features Kate Middleton and her ‘surprising style secret’ right below the Mandela’s tribute story. Oh, Hollywood. There’s also a large feature on the Jolie-Pitt children, all grown up and ready to take over the world. Well, that last part wasn’t included in the magazine, but it’s true. I can already see Vivienne ruling Hollywood in twenty years time, Maddox becoming some rock star, Pax becoming some government dignitary, and Zahara becoming our world’s benevolent ruler. 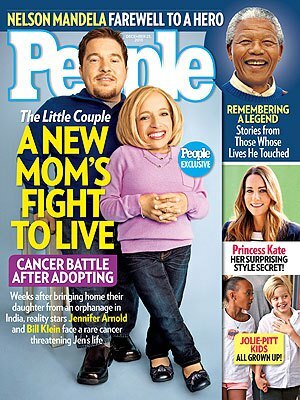 The main report on the cover is devoted to TLC’s The Little Couple, which focuses on Jen Arnold and her husband, Bill Klein. Jen, who is getting ready to fight after her cancer diagnosis earlier this week, tells People, “There are moments I feel just terrible. I can’t believe it is happening. Other times, I feel like this is just a bump in the road.” Her fight against cancer will be detailed in full on the show, which airs every Tuesday. Britney Spears Reveals That She’s Gotten Lip Injections – Duh?